We had our breakfast at E-Da Skylark hotel before departing to Tainan. As usual we have our breakfast at around 8 am. 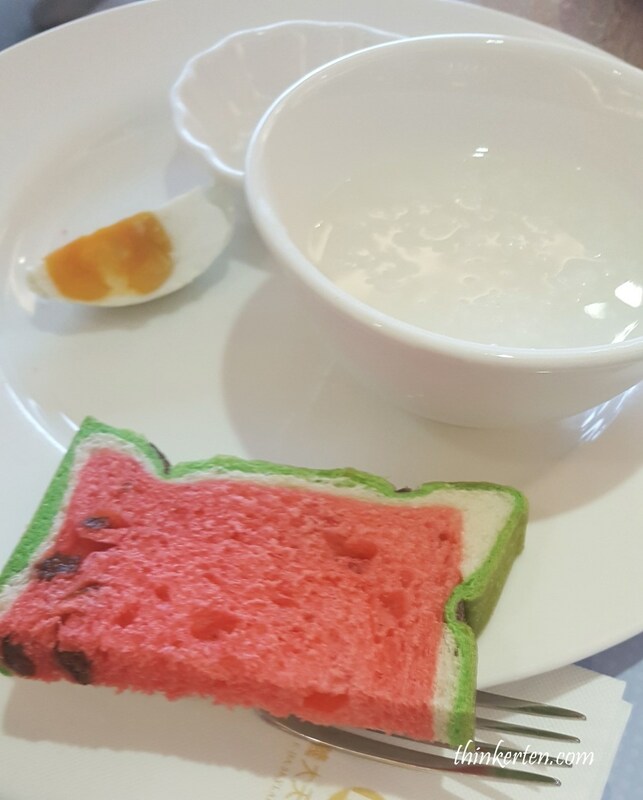 The variety was good but I only had a simple white porridge with some pork floss topping and quarter of the salted egg. You will know why I can’t eat more than usual for today. Fo Guang Shan is about 10 mins drive from our E-Da world. We decided to pay a visit to the temple before heading to Tainan. Fo Guang Shan, is located at Dashu District in Kaohsiung. It is the largest Buddhist monastery in Taiwan. It was founded in 1967 by a Buddhist monk called Hsing Yun/星雲大師. 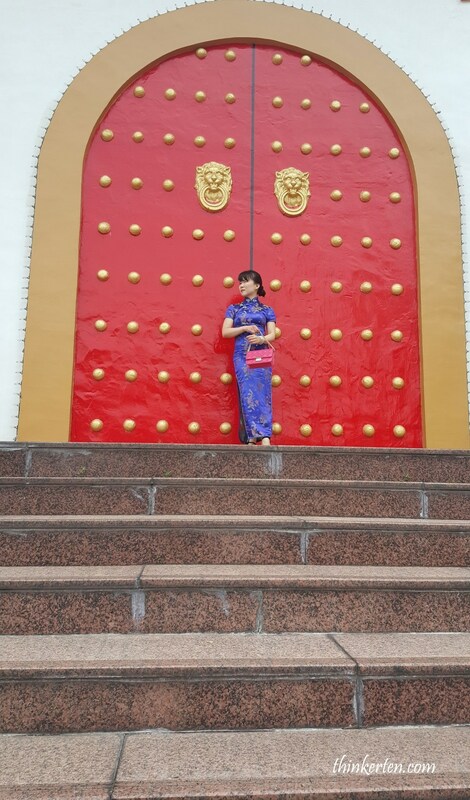 I was standing at one of the main gate of the Fo Guang Shan Temple. When we arrived at Fo Guang Shan, I was shocked by the size of the whole place. When I looked at the map given by the temple, I almost fainted. The temple is on the hill and there were many slopes and stairs. 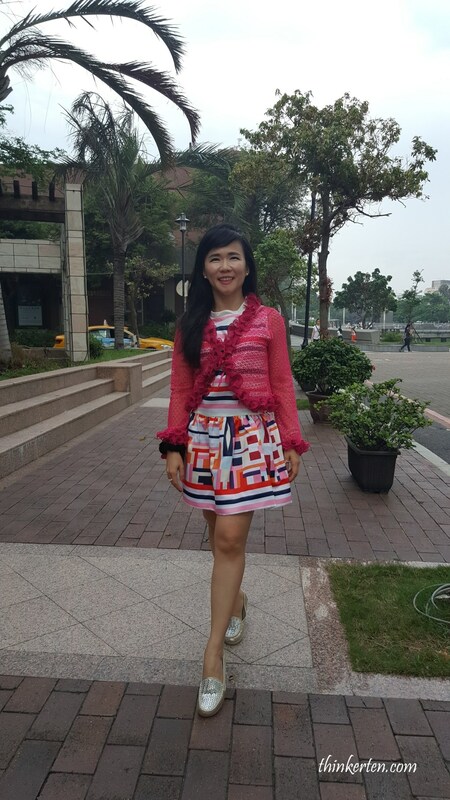 I normally love to climb slopes and stairs but it was challenging with today’s outfit. The temple has plenty to see and explore but most importantly, with many great photo opportunities. The place is very big with few attractions, such as these little arhat statues. The little arhats/羅漢 were located not too far after entering the main gate. 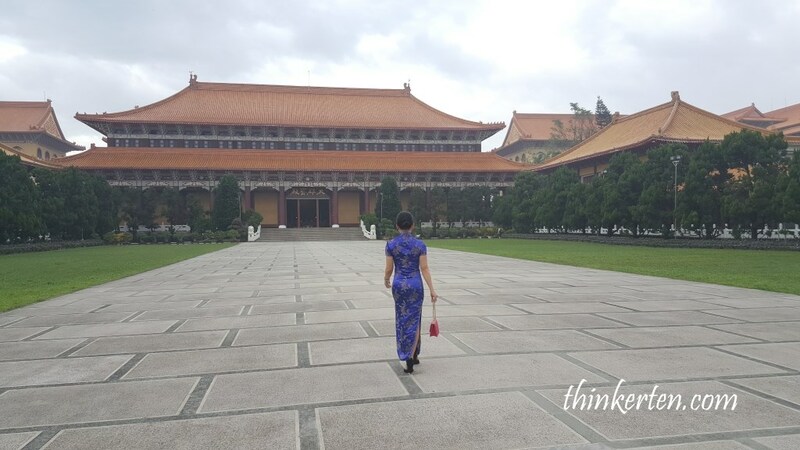 Despite the challenging outfit, my mind and soul was at ease when I was walking at this huge and spacious Fo Guang Shan temple. There were not many visitors when we were there. 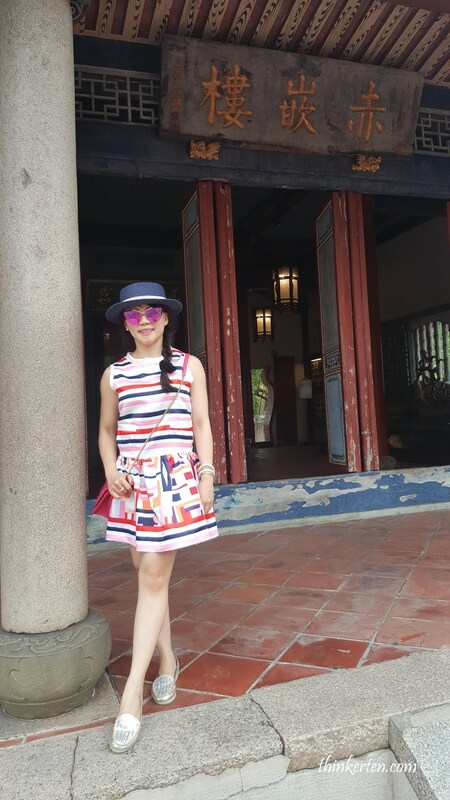 I can spend a whole day visiting all the places and admiring the beautiful architecture, garden and pagodas. I was told we could stay a night at the temple and I heard there were some activities for the visitors but I wasn’t sure about getting up as early as 5.30am and chanting. There are vending machines for drinks in case you get too tired and thirsty. There is also a restaurant where you could get your vegetarian lunch. 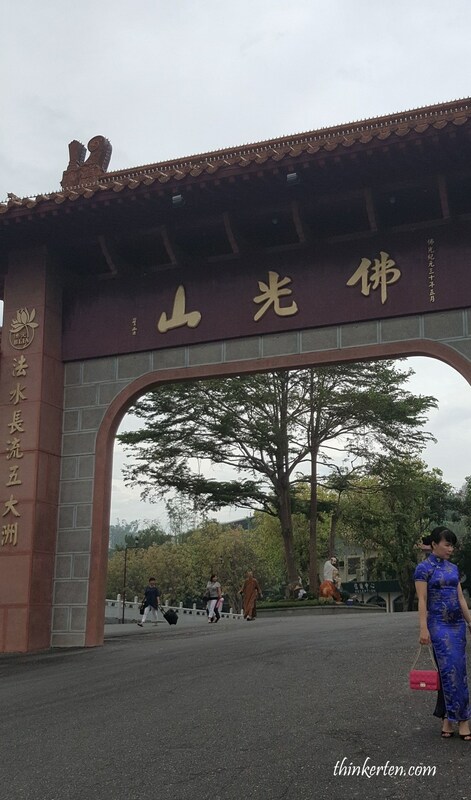 The atmosphere in Fo Guang Shan temple was tranquil and serene. The weather was still cooling in the early morning of October. 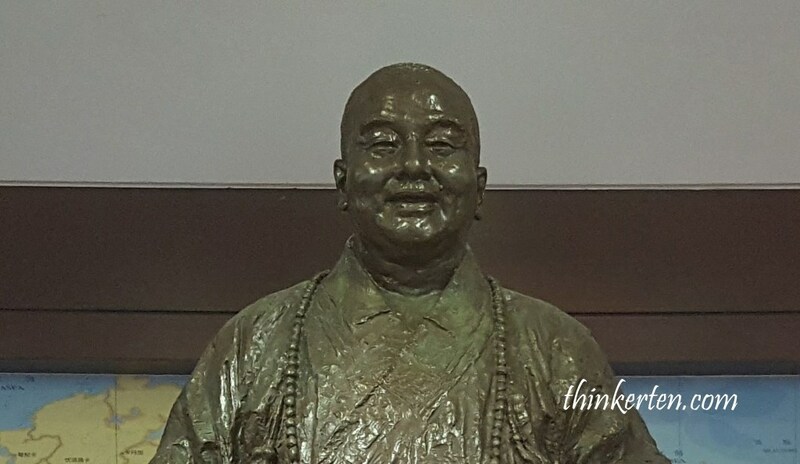 There is a huge iconic Buddha statue in Fo Guang Shan. 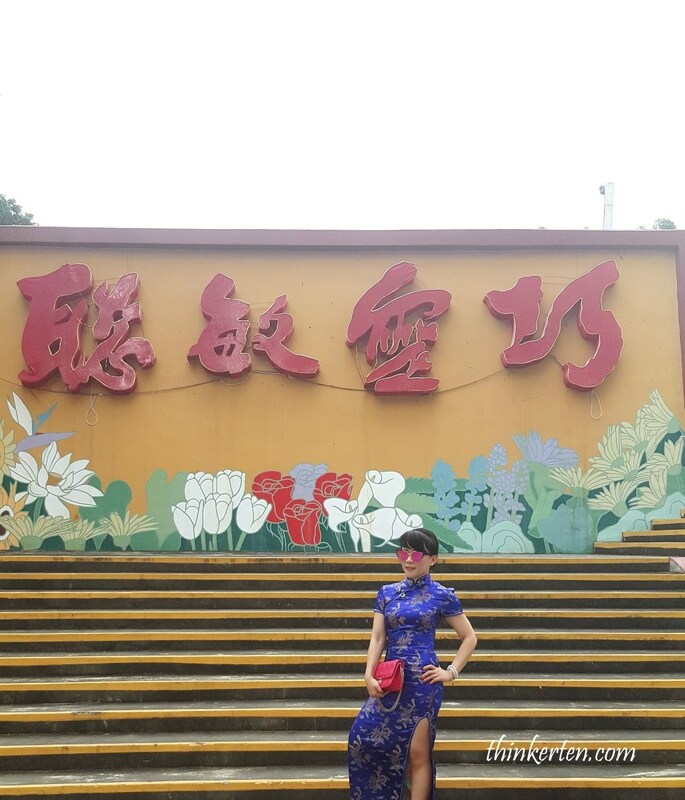 I didn’t manage to go near the 108 meters tall Buddha because the temple was just too big, especially walking with my blue qipao and heels. I only watched it from afar. The sky started to drizzle before we left, a kind lady who worked in the temple invited us to go in the sheltered hall. 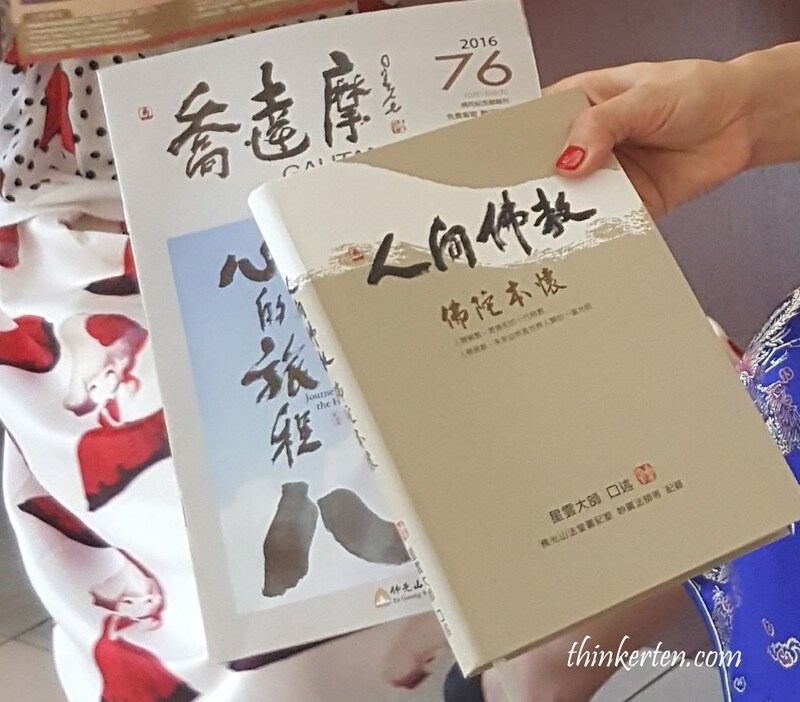 A kind monk then handed me one of Monk Hsing Yun’s/星雲大師 book, Renjian Fojiao/ (Humanistic Buddhism) to read while waiting for the rain to stop. She also offered us some hot tea. From Fo Guang Shan temple to Anping Fort in Tainan, is about 67km, slightly more than one hour drive. 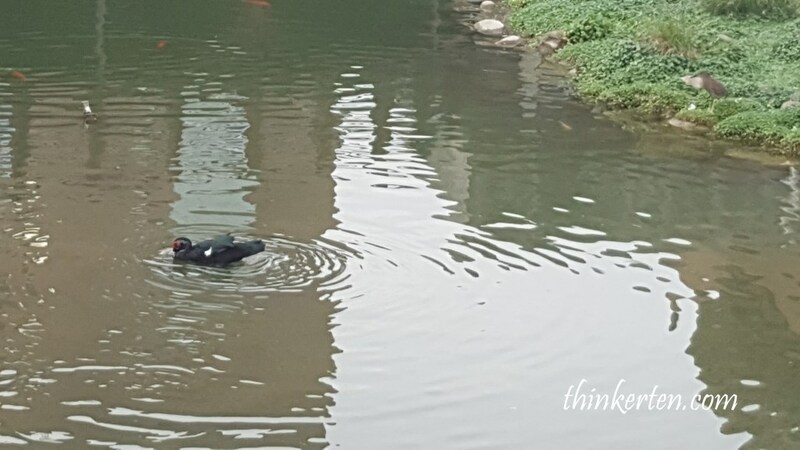 Going to Tainan is more than just food, Tainan is the most historical town in Taiwan. The Dutch build the first fort in Anping/(Tainan), it was called “Fort Zeelandia”, currently known as Anping Fort. It was used as a trading hub and international business center during the Dutch regime. 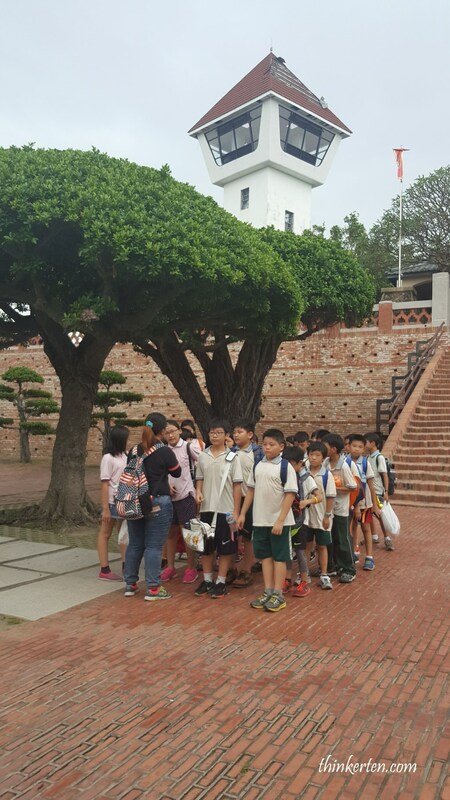 Some Taiwanese students were there having field trip when we arrived at Anping Fort. It was a popular spot for students to learn about Taiwan’s history. There is also an entrance fee to pay NT50. I noticed red bricks were widely used to build the Anping Fort. The red brick stone walls are still intact and there are a few cannons placed around. 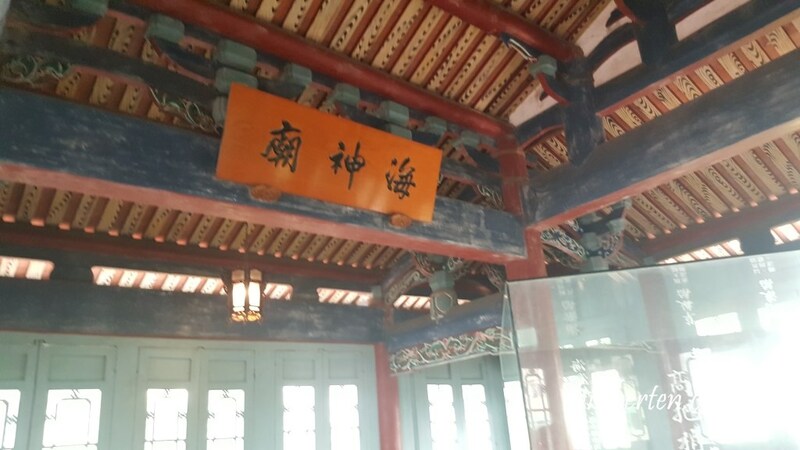 Later part of the history, Zheng Chenggong/鄭成功 or better well known in his Hokkien name Koxinga/國姓爺 a half Japanese-Chinese Scholar took over the fort from the Dutch in Ming Dynasty. 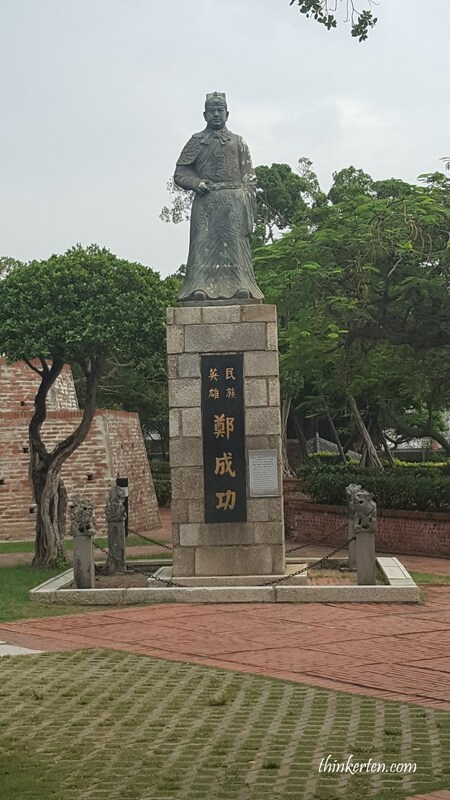 There is a big statue of Zheng Chenggong standing elegantly in the Anping Fort. There is also a museum or I rather called it few small rooms in the Anping fort telling bit and pieces about the Anping Fort history. 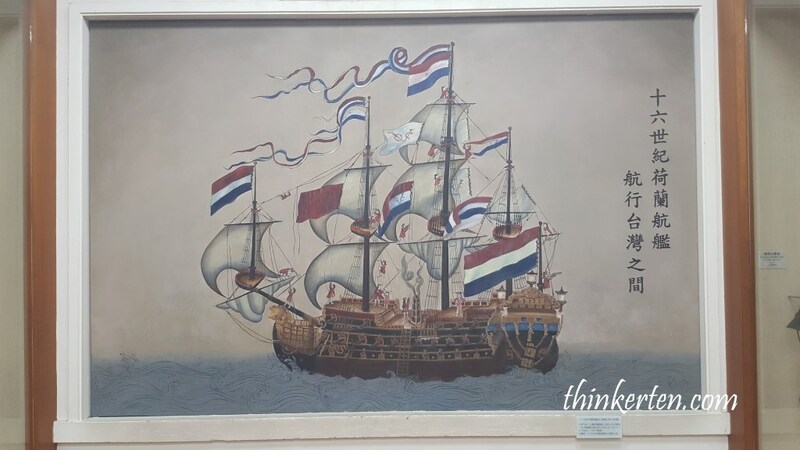 Below is one of the picture showing Dutch war ship in the 16 century. 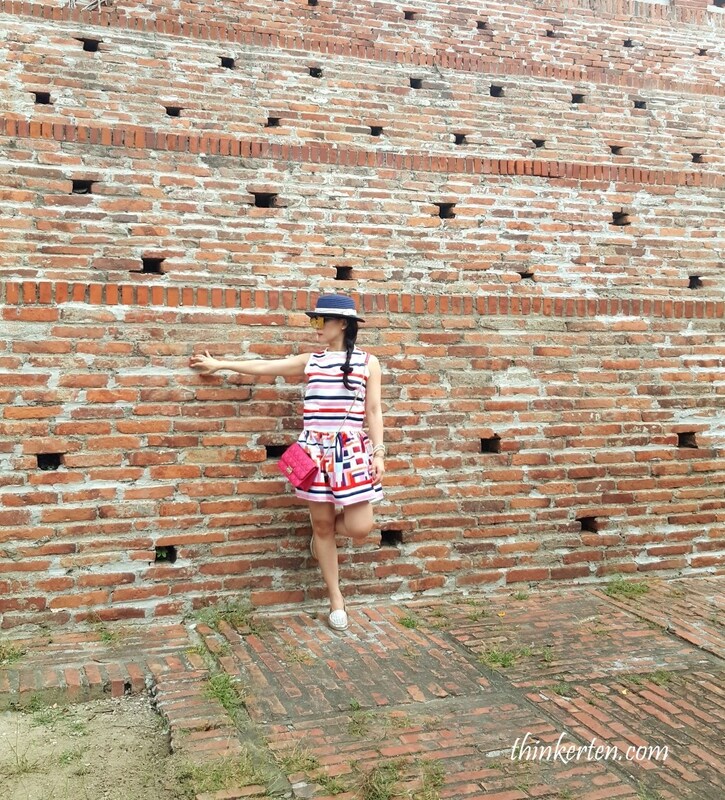 The Anping Fort is an interesting place to find out more about Taiwan past. You can also rent a bicycles to explore around the area where many food stalls selling Taiwanese local delight. After visited Anping Fort, we walked to the famous Anping old street/安平老街 which is just next to Anping Fort. I had a Taiwanese hot sausage on my way back to the car park. We also stop by for the popular Taiwanese bubble tea. 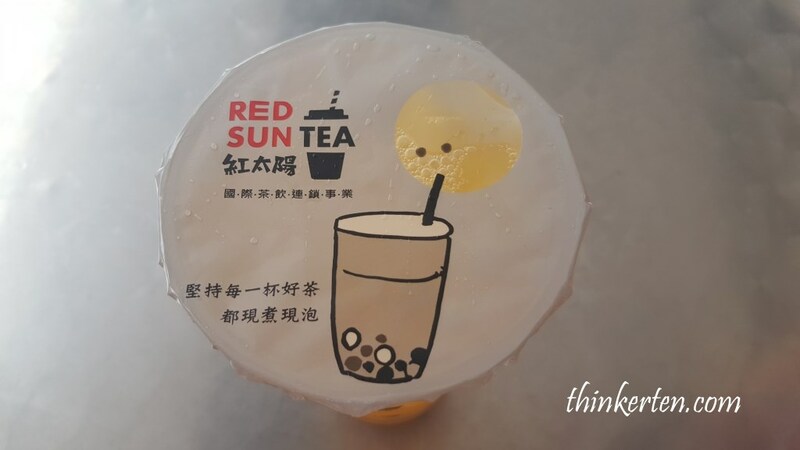 Do you know bubble tea is originated from Taichung in the 80s but too bad, my 8 days round the Taiwan island did not cover Taichung. 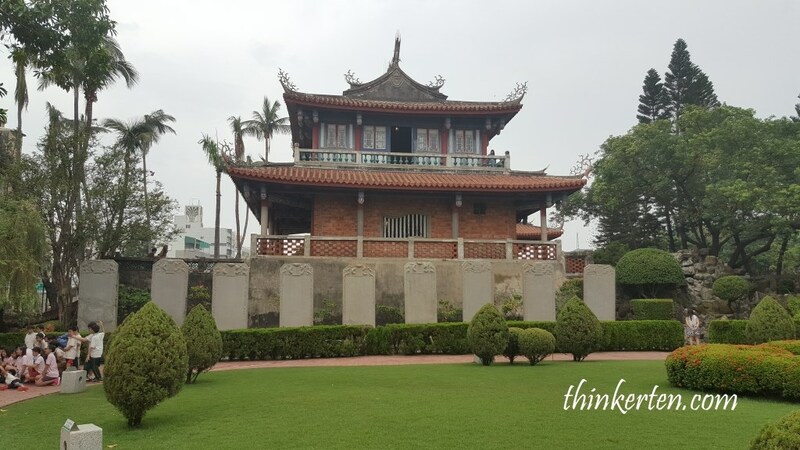 Chihkan Tower is located in the city, not far away from the Anping Fort. Chihkan Tower was also built by the Dutch originally. However, the building is quite old and would be better if more maintenance is done. It is both confusing and interesting to see there is a combination of Dutch and Chinese style building in the architectural parts. Chikan Tower is also called Provintia, it means eternity in Dutch. 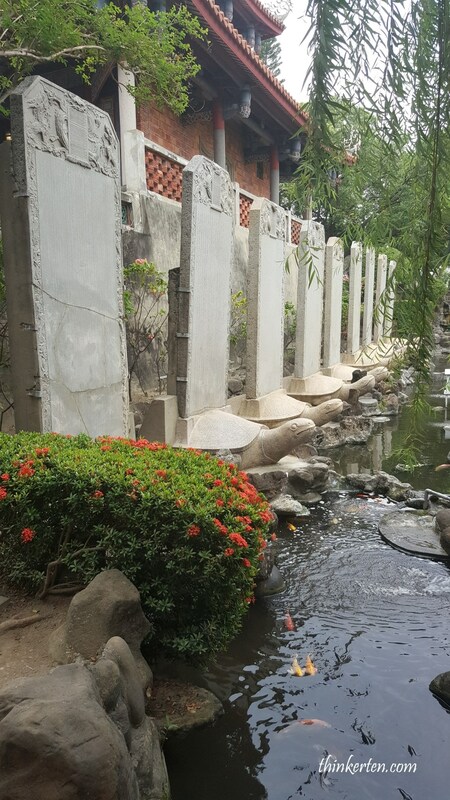 There are in total 9 statues of turtles,each carrying a stone plate on its back near a small pond in Chihkan Tower. One of the building in Chihkan Tower showing a yellow signboard ” Haishen Miao”. 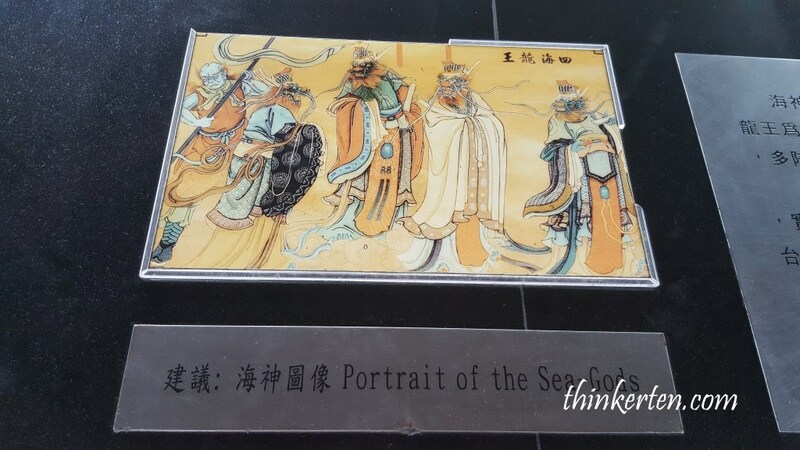 Inside the Haishen Miao, a portrait showing Haishen also known as Sea God. ChihKan Tower probably is not the best choice to visit if you don’t like history. 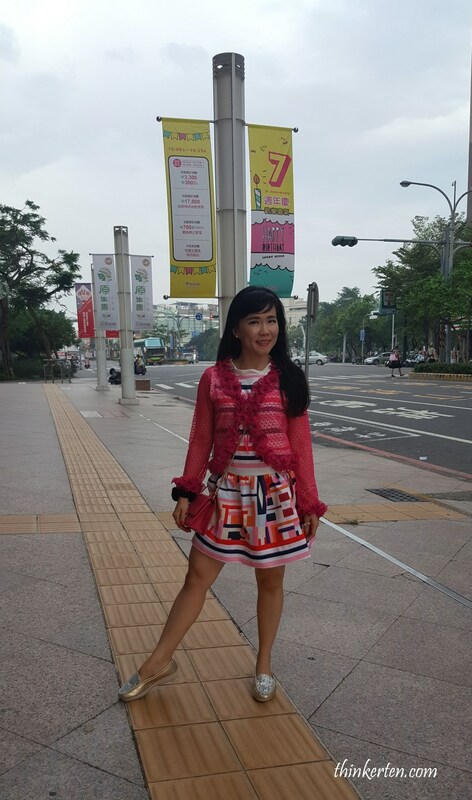 I wonder what else could I do coming all the way to Tainan, the most historical town? To me, it is still worth to spend a short visit to learn some history. We checked in to Evergreen Plaza Hotel in Tainan at around 4 pm. The hotel is belong to the Eva group. On our first day in Keelung, we also stayed in Evergreen Laurel. I find the Evergreen hotels are normally quite clean and well maintained. The hotel is located next to a big Department Store, called Durban. We had a stroll in the area but we were too tired and no more shopping for me. There is also a peaceful Barclay Memorial Park nearby the Evergreen Plaza Hotel. This morning we had a retreat in the Fo Guang Shan Temple in Kaohsiung and in the afternoon, we had few history lessons about Tainan Anping Fort and Chihkan Tower. It was a rewarding day.